In this episode I am completing the explanation about the integration fitchain-oceanprotocol that allows secure on-premise compute to operate in the decentralized data marketplace designed by Ocean Protocol. As mentioned in the show, this is a picture that provides a 10000-feet view of the integration. In this episode I briefly explain how two massive technologies have been merged in 2018 (work in progress - one providing secure machine learning on isolated data, the other implementing a decentralized data marketplace. In the attempt of democratizing machine learning, data scientists should have the possibility to train their models on data they do not necessarily own, nor see. A model that is privately trained should be verified and uniquely identified across its entire life cycle, from its random initialization to setting the optimal values of its parameters. 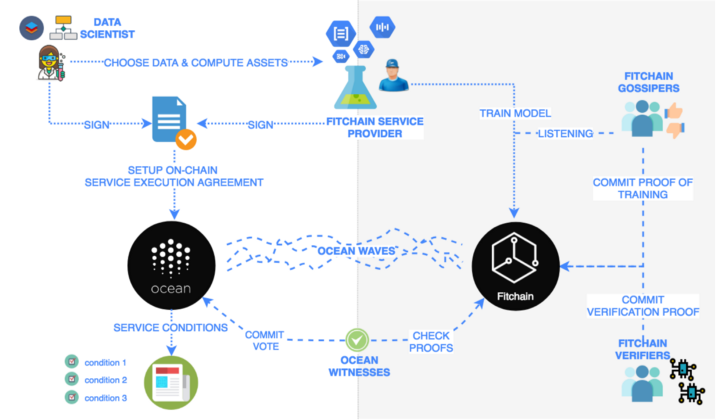 The Fitchain team has also coined a new term called “proof of train” – a way to guarantee that the model is truly trained at the organization, and that it becomes traceable on the blockchain. To develop the complex technological aspects of the platform, Fitchain has partnered up with BigChainDB, the project we have recently featured on Crypto Radio. Fitchain team is currently validating the assumptions and increasing the security of the platform. In the next few months, they will extend the portfolio of machine learning libraries and are planning to move from a B2B product towards a Fitchain for consumers. By June 2018 they plan to start the Internet of PODs. They will also design the Fitchain token – FitCoin, which will be a utility token to enable operating on the Fitchain platform.